“Merger and acquisition continues” for top manufacturers of casino games products, said a Tuesday note from brokerage JP Morgan Securities Australia Ltd. The note highlighted several recent transactions in the online digital casino games sector. It included Monday’s announcement that International Game Technology Plc was modifying its current exposure to the social casino games segment by selling its Double Down Interactive LLC unit to South Korea’s DoubleU Games Co Ltd for US$825 million cash; and the news on April 11 that Scientific Games Corp had acquired – under terms that were not made public – the privately held, Tennessee, U.S., -based, Spicerack Media Ltd, developer of a game called Bingo Showdown. 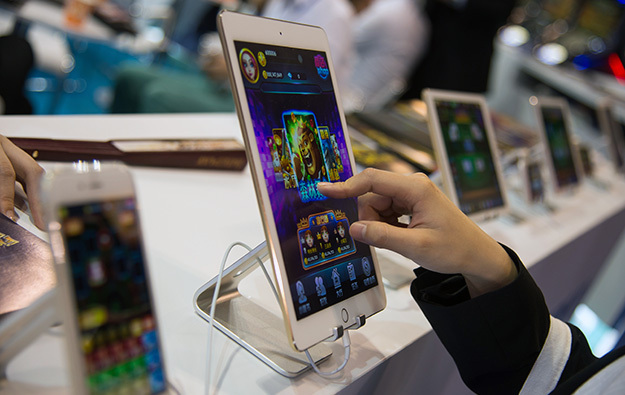 “Merger and acquisition for electronic gaming machine manufacturers would be a key feature for 2017… driven by consumer preference for mobile,” suggested the memo from Donald Carducci, Shaun Cousins and Shalin Doshi. The brokerage said Scientific Games had reported the Spicerack deal had been “immediately accretive for earnings and cash flow”. The note also mentioned the development of the digital online business of Australia-based slot machine maker Aristocrat Leisure Ltd.
Aristocrat launched at the end of December a digital platform application called Cashman Casino. The group says it is designed to complement its Heart of Vegas app. The latter was first released for the social media platform Facebook in 2013, and an iPad app was launched in September 2014. “We think digital will drive Aristocrat earnings growth across platforms (iOS/Android) and multiple apps (Heart [of Vegas] and Cashman) as a result of title performance,” said the JP Morgan team. Aristocrat Leisure’s revenue from digital operations rose 89.5 percent year-on-year in financial year 2016, to AUD279.7 million (US$211 million), according to its annual results filed in November. The Everi brand was formed in August 2015, following a US$1.2-billion merger of Las Vegas-based Global Cash Access Holdings Inc and Multimedia Games Holding Co Inc.
Mr Katz estimated that in the first quarter of this year, IGT’s revenue from social gaming had posted a 28.3 percent decline year-on-year, to US$57.4 million, from US$80.1 million in the prior-year period. He forecast that for Scientific Games, revenue from interactive operations would be up 22.1 percent year-on-year, to US$88.7 million, in the three months to March 31; while for social games the group’s revenue in that quarter would be up 37.3 percent from the prior-year period, to US$80.3 million. Mr Katz stated in a follow-up Tuesday note – after the IGT announcement regarding Double Down – that the move was “a positive” for IGT’s shares. “We estimate Double Down represented only 4 percent to 5 percent of IGT’s consolidated EBITDA [earnings before interest, taxation, depreciation and amortisation],” said a Tuesday note from analysts Cameron McKnight and Robert Shore at Wells Fargo Securities LLC. IGT’s stock had risen 4.37 percent in New York on Tuesday during regular trading hours, according to Bloomberg data.